Don't toss that leftover turkey carcass! Repurpose it into a whole new meal with a stock made from the bones for turkey noodle soup. Don't throw away that leftover turkey carcass. 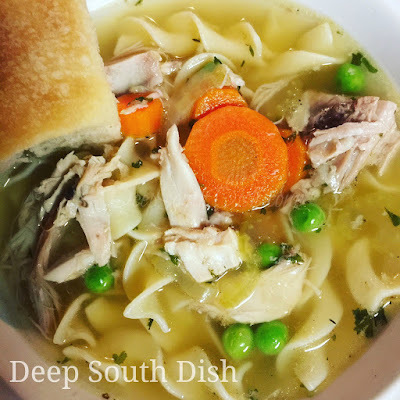 Turn it into a warm and comforting turkey soup. Pick the carcass pretty clean and break it up, splitting off the bones. Place the carcass in a tall stockpot, add the turkey or chicken stock, and additional water only if needed to cover the carcass. Cover pot and bring to a boil, reduce heat, remove the lid and simmer (do not boil) uncovered, skimming off any foam that accumulates. When foam subsides, add the salt, celery, carrot, onion, and bay leaf. Cook, uncovered, at a steady, slow simmer for about 2 hours. Strain, but reserve the broth - don't pour the broth out!! Discard the vegetables. Put the broth back into the stockpot. To the broth add in the chicken base, garlic, celery, carrot, and onion. Sprinkle in thyme and pepper. Allow to low simmer until vegetables are tender. Add the leftover turkey meat, peas and the noodles* to the broth and simmer until noodles are tender. Garnish with a sprinkle of parsley if desired; taste and add salt and pepper as needed. Cook's Notes: *Alternatively you may also cook the noodles separately and then spoon cooked noodles into a serving bowl and ladle the soup on top. I personally prefer this way because the noodles tend to soak up a lot of the broth of the soup otherwise. If you are making this ahead and have time, you may also let the broth cool and refrigerate. Once well chilled, the fat will rise to the surface and harden and you can easily scoop it off. Excellent. Just made this and added a raw roughly chopped jalapeno to the stock. Added some kick to the finished product. Added frozen corn and peas to finish it. Excellent is an understatement. VERY good. Thanks a ton. Also, easily made gluten free as I have celiacs. Thanks! You're welcome - glad y'all enjoyed it!! Made this soup today for my boyfriend who is under the weather...followed all ingredients to a T and added 1 teaspoon of Sriracha for some warmth...it was amazing! Thank you so much for posting this recipe. Yummy! You're very welcome Brandy & thanks for stopping by to let me know you enjoyed the soup! I hope that your boyfriend is on the mend - the change in weather and big events with lots of people get me every time and when I start feeling buggy, this or the chicken noodle hits the spot! I'm SOLD!! This is an easy to follow recipe for an ADHD mom. Lol! It's delicious! I'm a New Orleans Creole, we know what good food is. Haha! Thanks so much for sharing. Hi Lee! Doesn't it feel good to "use it up" too? The carcass makes such a great soup (or turkey bone gumbo - you'll have to try that one next!) that I don't understand why folks throw them away. So glad to hear that you tried it and enjoyed it!! Mary, we're having a cold snap here in Texas and I made a pot of this yesterday with turkey we fried. OMG, I'm never throwing away another turkey carcass. It is SO good. It'll make you want to "slap your mama". I'm gonna try to freeze some of it. Does it freeze well? Isn't it crazy Scott?! I don't know why everybody doesn't do that with their leftover turkey carcass. I mean it's practically a free meal, right? The soup freezes very well. There might be some texture change in the noodles on freezing, depending on how many there are. Doesn't bother me, but since I prefer to spoon the soup over cooked noodles instead of cooking the noodles in the broth, I usually freeze the soup and make fresh noodles when I thaw it. OK, this is interesting. I'm one of those who throw that carcass away. I have a board for turkey leftovers that I'm going to pin this to it and hope I remember next time I have one. Thanks!! I know. It's hard to remember after all that cookign! What I do is once the turkey meat is carved off, I break down the carcass and stick it in a big Ziploc bag and throw into the fridge or freezer.